Bestselling author Kris Vallotton reveals God's true plan and purpose for women--in the Church and throughout creation--as well as men's important role in restoring women to their rightful place. Shedding light on the true meaning of difficult Bible passages about women, Vallotton takes readers on an eye-opening journey. 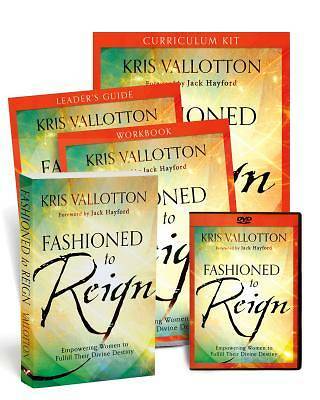 In the eight-session curriculum kit, you'll find a DVD with eight 20-minute teaching sessions from Kris Vallotton, a leader's guide for facilitating groups, a participant workbook, and a copy of Fashioned to Reign. Ideal for small groups, church classes, or independent Bible studies, here is everything you need to delve deeper into Jesus' revolutionary message.